Lidl, along with its fellow German discounter Aldi, might be growing strongly in the UK right now but it wasn’t always that way. Its former UK boss, Ronny Gottschlich, says that in the early years the discounters were really small players. 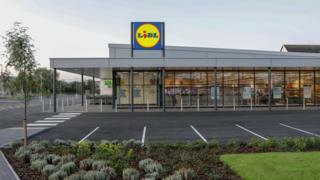 Lidl now has more than 700 stores in the UK and is opening a new one on average every week. It plans to invest £1.45bn in the next two years. According to Kantar Worldpanel, both Lidl and Aldi have increased their market share steadily over the last couple of years, with Lidl now accounting for 5.3% of the UK grocery market and Aldi 7.5%. One of the ways the discounters attract shoppers is with the so-called “middle aisle” – a smörgåsbord of products from kids’ toys to electricals. “If you put some new offers in twice a week to your store there is a reason why customers would want to come in,” says Mr Gottschlich. And the biggest seller might surprise you. It’s not all successful though. For instance, the supermarket once tested a Spanish red wine that it liked and wine connoisseurs recommended as being good value for money. But customers didn’t agree. ← Has Meghan's accent changed since marrying Prince Harry?